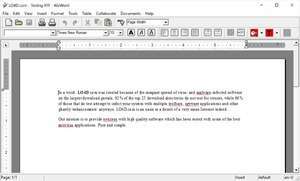 AbiWord is a full and extensive word processor with features and a feel similar to older, more classic versions of Microsoft's Word product. Unlike Word or WordPerfect, AbiWord is completely free and maintained by an open source community. The program doesn't really provide many advantages over classic versions of Microsoft or Corel's word processor products, except that it is completely free. Some useful features worth mentioning here are the spell check, support for many popular document formats (docx, doc, html, txt, rtf, etc. Version 2.8.6 is a freeware program which does not have restrictions and it's free so it doesn't cost anything. For security reasons, you should also check out the AbiWord download at LO4D.com which includes virus and malware tests. Additional screenshots of this application download may be available, too.